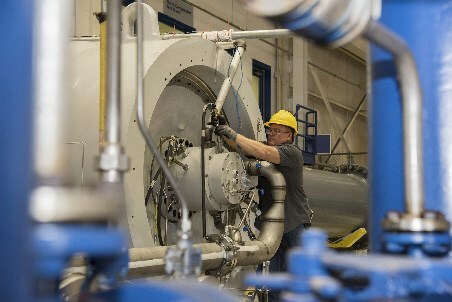 Siemens has received an order from North American pipeline operator, Nova Gas Transmission Ltd. (NGTL), a wholly owned subsidiary of TransCanada Corporation, to supply a gas turbine-driven compressor train for the Winchell Lake Compressor Station in Alberta, Canada. "Siemens: new compressor train order"
The turbo-compressor train will be a critical part of the NGTL pipeline expansion to transport natural gas to export markets. Commercial operation is expected to begin in the 4Q19. TransCanada's Winchell Lake Compressor Station re-pressurises natural gas along the NGTL's Western Alberta System Mainline. This line, via the Gas Transmission Northwest (GTN) System that begins at the Kingsgate compressor station located at the British Columbia-Idaho border, exports natural gas into Washington, Oregon, California, and Nevada. The scope of supply for the compressor train includes an RFBB36 pipeline compressor driven by Siemens aeroderivative SGT-A35 gas turbine (formerly the Industrial RB211), and associated auxiliary systems. The SGT-A35 gas turbine configuration incorporates a variety of proprietary technical features that have positioned the turbine as the engine of choice for reliability and lowest total cost of operation in the gas transmission market. The RFBB36 compressor met all project specifications because it offers some of the highest compression efficiency in the midstream market while delivering the lowest CO2 and methane gas emissions compared to other pipeline compressors. "Siemens has provided TransCanada with customer care services for many years and offers support to its approximately 160 aeroderivative gas turbines operating today," said Patrice Laporte, Vice President, Oil and Gas for Siemens North America. "In addition to our good relationship with TransCanada, our proven solution provides an especially efficient, cost effective, and environmentally friendly option for safely transporting natural gas to markets and consumers," Laporte added. "TransCanada is pleased to work with Siemens on the Winchell Lake Compressor Station Project which supports the movement of WCSB gas to export markets," said Terri Steeves, Vice President Canadian Projects.